Knowledge representation in the BEST Author module is based on graphical models, which are precise, comprehensive, yet easy-to-use. Through its intuitive interface and following a top-down approach, BEST Author allows you to incrementally encode your expert knowledge of a technical system. You describe the functional structure by going from the general to the specific, decomposing your overall system into sub-systems and sub-sub-systems, until you reach the level of Least Replaceable Units (LRUs) and their corresponding failure modes. Furthermore, you can provide estimates for the failure probabilities for each component. However, such estimates need not be perfect. In fact, for new products you may only have very rough estimates. BEST Author will automatically and continuously update these estimates by machine learning from in-service experience. Based on the description of components and failures, you can define what diagnostic and repair actions are available. For each action, you also specify the cost, the required qualification of the service representative/technician, plus any other constraints. All of this will be utilized in the troubleshooting model. 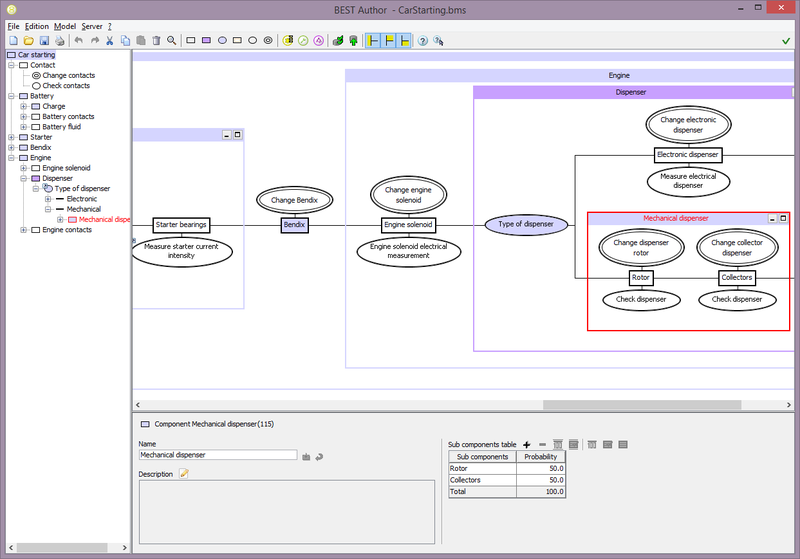 For very complex systems, BEST Author allows you to separate a troubleshooting model into several submodels. This way, various experts can easily contribute their specific domain knowledge to an overall model.